Scroll.in's queries for information were dismissed on grounds of national security and confidentiality. 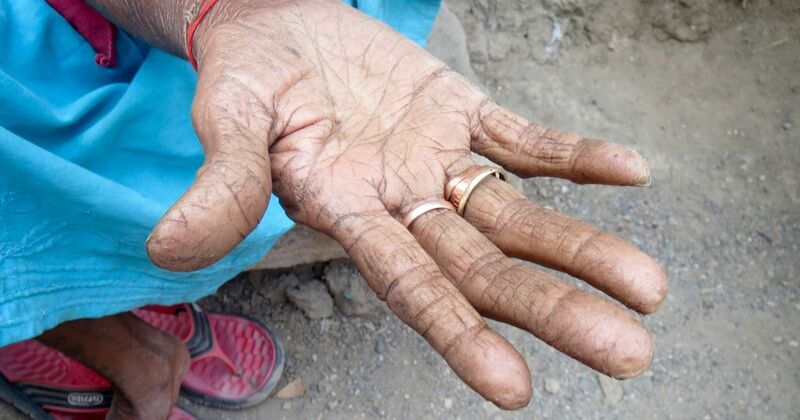 The first signs of trouble came on February 24 with media reports that the Unique Identity Authority of India – which enrols residents, stores and manages their biometric data, and issues the 12-digit Aadhaar numbers – had, in a first, registered a complaint with the Delhi Police against Axis Bank Limited, Suvidha Infoserve, which is a business correspondent with Axis, and esign provider eMudhra. The three are accused of performing multiple Aadhaar transactions using stored biometrics in violation of the Aadhaar (Targeted Delivery of Financial and Other Subsidies, Benefits, and Services) Act, 2016, which prohibits the storage of such data. In all of the above cases, it is not clear if the individuals whose personal data was compromised were even informed of it. This leads to the question: what right to information does an individual have in the case of such a security breach? The Aadhaar number of an individual shall not be published, displayed or posted publicly by any person or entity or agency. However, at the same time, the Aadhaar Act lacks any provision for a mandatory notice to an individual in case of a breach of his or her information – which was a recommendation of the Justice Shah Committee on Privacy in 2012, which was set up to lay the ground for a comprehensive new privacy law. Thus, under the law, Aadhaar users have no right to be informed when a crime related to their personal data occurs. And they cannot approach a court directly because under Section 47 (1) of the Aadhaar Act, the Unique Identification Authority of India has the exclusive power to make complaints in case of any violation or breach of privacy. In the case of Axis Bank and the other two firms, the Authority has temporarily stopped them from conducting Aadhaar-based transactions while the investigation is on, but it is not clear if any notice has also been sent to the individuals whose stored biometrics were used illegally by the firms. What’s more, information regarding breaches and security-related incidents is not accessible even under the Right to Information Act. In response to a right to information application filed last year in the course of Scroll.in’s Identity Project series, the Unique Identification Authority of India refused to share data on how many security breaches, intrusion attempts or security incidents it had detected or been notified of. It denied this information for both its Central Identities Data Repository, where it stores all core biometric information, as well as for the other databases it maintains. 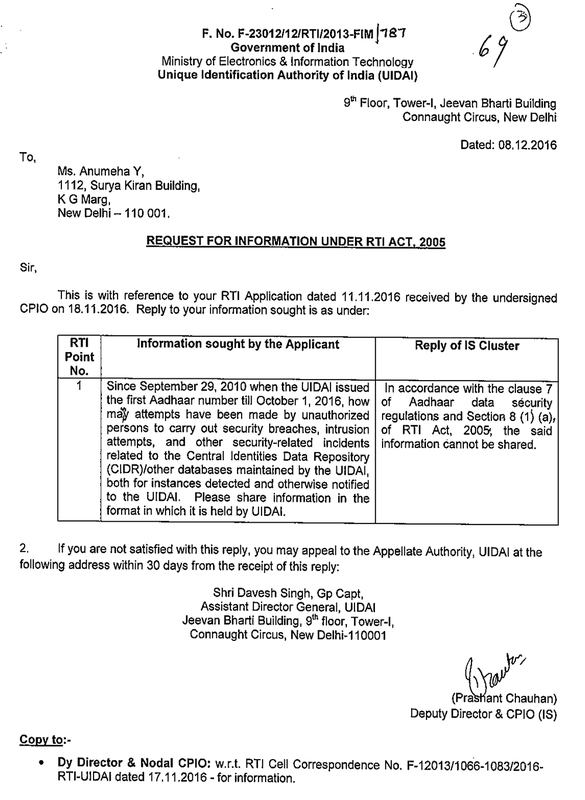 The Unique Identification Authority of India denied sharing information on data breaches under an RTI query filed by Scroll.in. (a) information, disclosure of which would prejudicially affect the sovereignty and integrity of India, the security, strategic, scientific or economic interests of the State, relation with foreign State or lead to incitement of an offence. It also cited Section 7 of the Aadhaar (Data Security) Regulations that deals with confidentiality of “procedures, orders, processes, standards and protocols” on security. Similarly, the Authority refused to share information on security practices, citing Section 8 (1) (1) of the Right to Information Act, and Section 7 of the Aadhaar (Data Security) Regulations. “…data being national asset and sharing the systems in place can affect the security interest of the UIDAI and may lead to incitement of an offence,” it noted in its reply to Scroll.in’s right to information application. 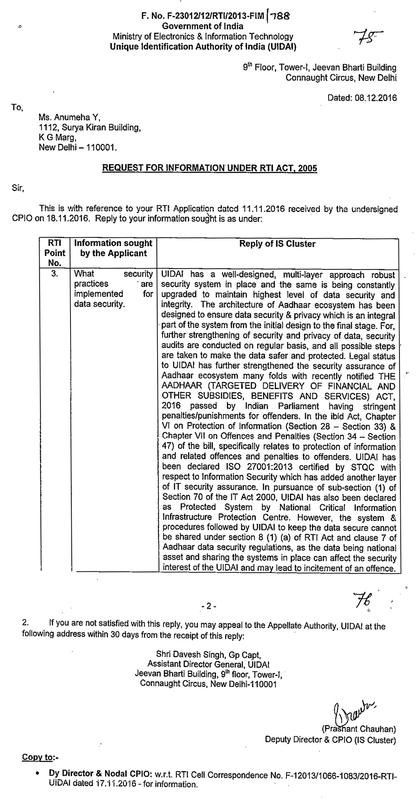 The Authority also declined sharing information on practices maintained for data security in reply to Scroll.in's RTI query. Legal experts said this absence of proactive disclosure in the Aadhaar system was in contrast with international norms on data protection and transparency towards users. Chinmayi Arun, executive director of the Centre for Communications Governance at the National Law University, Delhi, said that in the United States, every time a breach takes place, the authorities have to follow proactive disclosure requirements. According to technology lawyer Apar Gupta, “the UIDAI is a blackbox that cannot be opened even after a system crash”. Gupta pointed out that Aadhaar lacks an oversight mechanism, and a bounty reporting system that rewards those who find and report security flaws in its system – all measures that would encourage vulnerability testing to prevent hacks and exploitive acts. On the contrary, reporting security flaws may land one in trouble, as in the case of entrepreneur Sameer Kochhar. Last week, the Authority registered a police complaint against him after he published an article and video on his web magazine on February 11 demonstrating how Aadhaar systems were vulnerable to replay attacks in instances where firms registered with the Authority resorted to illegally storing biometrics locally. The Delhi Police are investigating the charges made by the Authority against Kochhar under Section 37 of the Aadhaar Act, which deals with the intentional disclosure of “identity information collected in the course of enrolment or authentication”. Lawyers and technical experts have criticised the Authority’s decision to take action against an individual for reporting a security vulnerability in Aadhaar.